The Karnataka state is divided into four parts based on natural vegetation and physical features. Gerasoppa was the capital of the Queen Chennabhairadevi known as Pepper Queen, ruled this region 400 years ago. The coastal region extends from Goa to Manglore and Gerasoppa being the centre place of coastal area and the districts of malenaad such as shimoga, Chikkamagaluru and Kodagu and malenaad can be said as the greenery of the state. 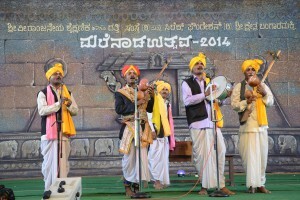 This festival is organized at the time of “Brahma Rathotsava to Lord Shree Veeranjaneya” a yearly religious activity. To popularize the “ Valley of Malenaadu” and the beauty and art of this festival include all types of music, dance, plays and many more. Preference and special attention will be given to the rural and traditional talents and there will be district wise concentration and displays within the Malenaadu districts. This festival is observed once in two years. To encourage the young talents of rural Malenaadu. To guide the young generation to perpetuate the ancient values and cultures. To guide the rural youngsters to adopt ideals of state and national level personalities who will be invited to the platform. To bring the hidden talents of Malenaadu districts to light by arranging various literary and cultural debates. To give opportunities, to exhibit all arts and products and bring the people together to make them acquainted with each other. The culture has the strength to carry the faith in God, religion,caste and creed together. 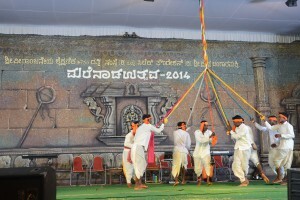 Thus MALENAADU UTSAVA is an occasion to link them. This festival involves not only cultural aspects but also involves literature, religion, education and geographical thoughts and there will be a debate on the subjects. The western ghat is known for its bio-diversity. So this is an effort to give it nation wide fame. The art of worshipping has saved many old traditions. The tribal and folklore arts have their own speciality. Totally it can be said that it is an opportunity to express not mearly arts But an exhibition of total cultural riches of Malenaadu. Participating districts : Uttara Kannada Udupi, Shimoga, Chikkamagaluru, Kodgu parts of Hassan and Mysore districts. Participants : Nearly 2000 artists from above mentioned districts. Expected Crowd : Around 20 thousand in seven days. Delegates : Renowned people from all the districts, known personalities from the state and different parts of the nation. Special award : “Shree Veeranjaneya Sujnana Shree” award will be bestowed to 1 distinguished personality, National Level. Award : “Shree Veeranjaneya Janapad Award” will be given to 10 people once in two years at Regional level.